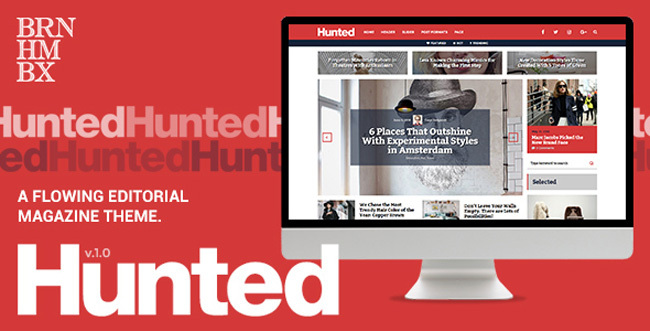 Hunted theme can be used for your stories, daily articles, fashion news, decoration tips, hangout advices and everything else regarding life.The theme comes with a sleek slider that can be used with 3 different styles, lots of extra options and in 3 different positions: Fullwidth, Cover and Among the Posts. It has 7 Different Layout Options: 1 Column, 1 Column + Sidebar, 2 Columns, 2 Columns + Sidebar, (1 + 2) Columns + Sidebar, 3 Columns and (2 + 3) Columns. Fullwidth versions of them are also available.Excluding the widgetized areas, you can place up to 5 different banners into 15 different positions. It’s as flexible as a visual composer! You can use 3 different fonts at the same time those chosen from 19 carefully selected Google Fonts. You don’t need to get drowned in strange language files. But if you wish, you can still use the included .pot file for your translations.